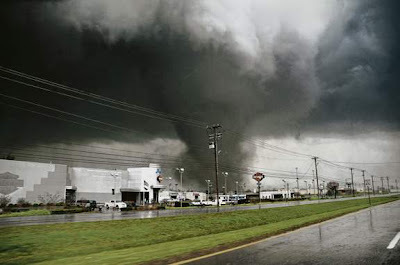 YOUR SAFETY DEPENDS ON BEING CONSTANTLY ALERT TO THE POSSIBILITY OF TORNADOES FROM THE THUNDERSTORMS THAT APPROACH YOU. THIS IS ESPECIALLY TRUE DURING TORNADO WATCHES. A CAREFUL LOOKOUT SHOULD BE KEPT DURING ANY PERIOD OF SEVERE WEATHER ACTIVITY. PLAN IN ADVANCE WHERE YOU WILL GO AND WHAT YOU WILL DO IF A TORNADO THREATENS YOU. REMEMBER... A TORNADO WATCH MEANS THAT TORNADO DEVELOPMENT IS POSSIBLE... SO WATCH THE SKY FOR DEVELOPING THUNDERSTORMS AND ALL THE HAZARDS THEY BRING. STAY TUNED TO WEATHER RADIO... COMMERCIAL RADIO OR TELEVISION FOR WEATHER STATEMENTS OR WARNINGS. A TORNADO WARNING... USUALLY ISSUED FOR 1 OR 2 COUNTIES AT A TIME... MEANS THAT A TORNADO HAS BEEN SIGHTED... OR INDICATED BY WEATHER RADAR. PERSONS IN THE PATH OF THE STORM NEED TO IMMEDIATELY FIND SHELTER... PREFERABLY IN A STURDY BUILDING... BELOW GROUND IF POSSIBLE. HERE ARE SOME TORNADO SAFETY RULES. IN HOMES OR SMALL BUILDINGS... GO TO THE BASEMENT OR STORM SHELTER OR TO AN INTERIOR ROOM... SUCH AS A CLOSET OR BATHROOM... ON THE LOWEST LEVEL. GET UNDER SOMETHING STURDY SUCH AS A HEAVY TABLE OR A BED. IN MOBILE HOMES AND VEHICLES... ABANDON THEM AND GO TO A STORM SHELTER OR STURDY STRUCTURE. IF THERE IS NO SUCH STRUCTURE NEARBY... LIE FLAT IN A DITCH RAVINE... GULLY... CULVERT... OR A LOW SPOT WITH YOUR ARMS AND HANDS SHIELDING YOUR HEAD. IN LARGE BUILDINGS SUCH AS SCHOOLS... FACTORIES... HOSPITALS... NURSING HOMES... AND SHOPPING CENTERS... GO TO THE PREDESIGNATED SHELTER AREA. INTERIOR HALLWAYS ON THE LOWEST FLOOR ARE USUALLY BEST. STAY AWAY FROM ROOMS THAT ARE LARGE IN AREA BECAUSE THEY HAVE WEAKLY SUPPORTED ROOFS. AT ALL TIMES... STAY AWAY FROM WINDOWS.